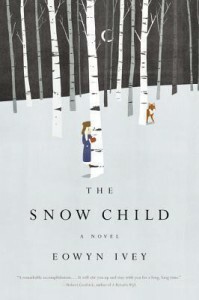 The Snow Child was absolutely beautiful. The story was beautiful, the language was beautiful, and the scenery was beautiful. It was full of love and hope. Jack and Mabel are two people who at times have difficulty communicating, which over the course of the twenty some years they have been married has led to some resentment and hard feelings, but they have a very deep love for each other, and I think Ms. Ivey did a wonderful job conveying this. I will grant that the opening of his book is rather despondent, which had me braced for a long, sad read. But everything changed the night that Jack and Mabel created their snow child. That night, we saw how completely in love with each other they were. Despite the biting cold, the joy described by Ms. Ivey was contagious. The emotions felt were a stark contrast to the weather. And that joy managed to carry through the book, despite the obvious heartbreak of these two souls so in love with each other, and so desperate to share that love with children which they were ultimately unable to have.